I had the good fortune of going to London recently for a honeymoon shoot as part of Carrie and Jake’s wedding photography. We call it a honeymoon session, or a day after session, and we offer worldwide travel for these kinds of shoots, but this post is not about that. As usual, no matter where I go or why I am there, I always like to make personal photos along the way. 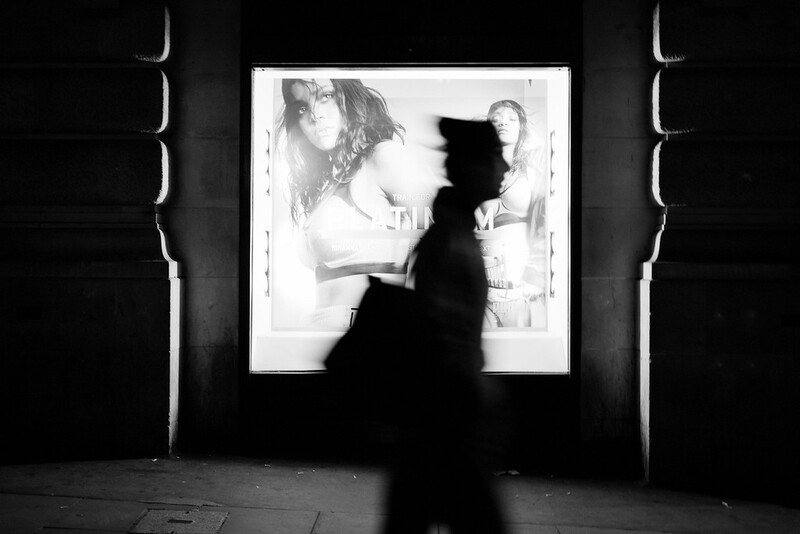 I made these one night when my wife and I were at Picadilly Circus, scouting some nighttime locations for the upcoming shoot. I really enjoy shooting at night and searching out light to work with. 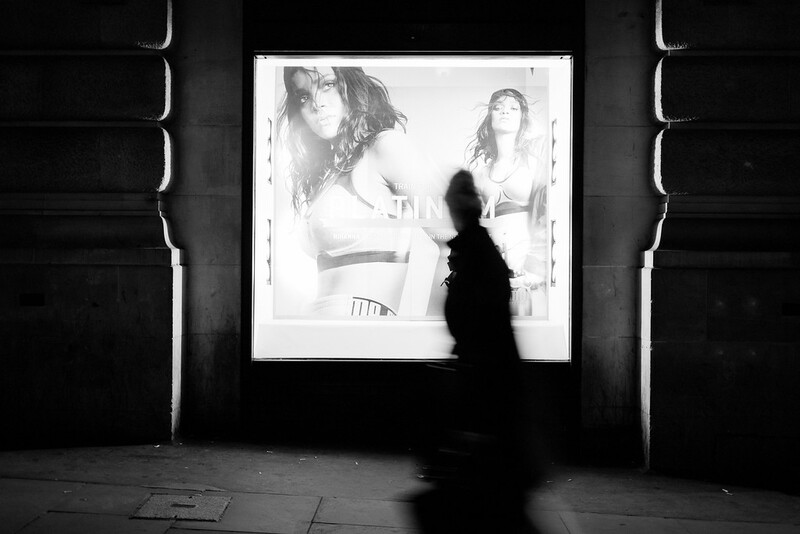 I noticed these new ads for Rihanna’s Puma campaign and thought they would make a nice soft light for a night time portrait if the opportunity should arise. 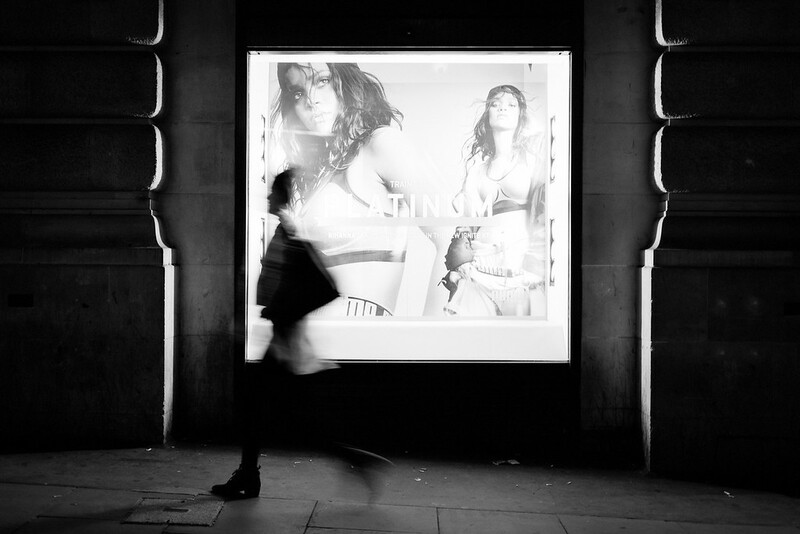 As I was looking around at all of the lighting options, soaking in this busy corner at night, I made a few frames of people passing by this Rihanna ad. Looking at the photos later found it striking that three different women all had similar hairstyles and were each carrying a purse on their shoulder in the same way. I think they go well together! And of course I’m a huge Rihanna fan. Tips for photographers: Keep your camera with you all the time. Countless photographers have given me this advice, countless times, but it never fails to amaze me that the second I don’t have my camera something catches my eye to photograph. I have recently started switching from Canon to Sony for this very reason: my Canon is too big of a beast to carry around casually and I found myself shooting on my iphone more than anything. When I saw these new smaller mirrorless camera bodies for the first time I knew it was the answer to my problem of leaving my camera behind, and I quickly settled in on Sony as the brand of choice, specifically the A7 series of full frame cameras and Zeiss lenses. Now I have a very small kit with the Sony A7ii and a few Zeiss lenses that can go anywhere with me, and it’s the only camera I carry when I’m travelling overseas. Often I will simply grab my A7ii with a 35mm on it and go. I’m not saying you should switch cameras, but just do whatever it takes to keep a camera with you and be ready for pictures when they happen in front of you.